Versatile PVC pipes can be converted into many useful household objects and are also used in making crafts. One simple, unusual way to use PVC pipes is cutting out and sculpting birds for lawn ornaments. A handmade, painted bird is more durable and attractive than commercially available pink flamingoes. Draw a bird with permanent marker on your PVC pipe so that it takes up most of the pipe's length. Draw it with long legs and a long, straight neck, like a heron or flamingo would have. Draw the wings so they curve up around the pipe. You can also use the bird template in the resources at the end of this article, and enlarge it to meet your needs. Cut out the bird shape with a fine-blade jigsaw. Use sandpaper to smooth the cut edges. Fill a large pot with boiling water and submerge your bird in the water to make it soft and pliable. If your bird is too large to submerge in the water, work on one part at a time. Bend the bird's neck and legs with pliers once they are soft enough. Bend the legs down until they are perpendicular to the body, and bend the feet so that they are parallel with the ground. 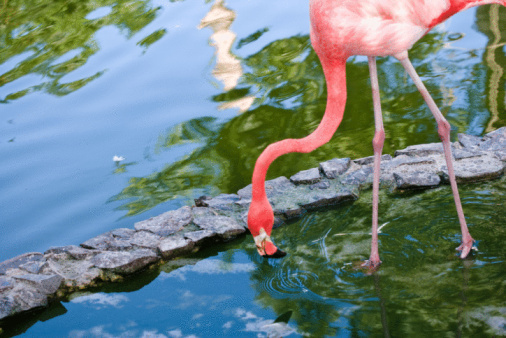 If you wish, bend one of the bird legs at the knee so it resembles a classic pink flamingo. Bend the neck and curve it in a couple places like a long-necked heron or flamingo. Allow the bird to cool. Paint the bird the color of your choice and allow it to dry. Drill holes in one or both bird feet and drive stakes or nails through the holes to stand the bird up in your lawn.